At Facebook's recent F8 conference, they gave a talk on how the News Feed works. Although we have covered individual changes in the past ( What The Heck is The August News Feed Change?, What The Heck is The March New Feed Change? ), it is a great time to review the Facebook News Feed as a whole and discuss how brands can engage their Fans with relevant content in 2015. Facebook's goal for News Feed is to show each user the "best" out of all the possible content that they could see. The "best" content is different for each user, based on who they follow and are friends with, who they interact with, and the type and quality of the content. The relationship with the author of the post - how much the user interacts with them in all parts of Facebook, including Messenger. This can change over time as engagement ebbs and flows. The type of content - does the user interact more with videos, photos or text? The most engaging type for that user will show up more often. The "quality" of the post - how much activity (likes, comments, shares) did it get from other users? Timeliness also plays a part in this - a post that got a lot of engagement yesterday, but not today, may not rank as highly. Each piece of content is given a relevance score based on the above criteria and then is ordered with the best content at the top. Once the content is displayed to the user, the rankings are locked for that content, and new content will get ranked and appear above it the next time the user views their News Feed. Facebook says that if a user scrolls through their entire feed, they would see all the posts from their friends. They would not necessarily see all posts from the Facebook Pages that they are fans of. A problem with ranking based on activity is that people try to game the system - "Share if you agree, like if you disagree" appeared in many posts, increasing activity levels. But, when Facebook asked users about those posts, most ranked them 1's or 2's on the relevance scale. There are also many posts that users did want to see, but didn't click like or share on. So, Facebook started a program where they hired a large "representative sample" of users to score posts in their own feed. They also occasionally ask general users to score posts. Facebook then meets each week to determine how they can get more 5's in the feed and fewer 1's. This is where a lot of the recent changes have come from. Based on interactions, these used to be ranked high, but users scored them as 1's or 2's. Click Bait posts - "You won't believe..." - also get ranked lower. Users may click them, but are often disappointed with the results. People don't want to see hoaxes in their News Feed. Facebook now lets users mark posts as "a false news story". Using that information, Facebook can either remove this content or show it farther down in the rankings. A user might be a Fan of a brand, but that doesn't mean that they want to see giant ads in their feed (unless, of course, the Facebook Page responsible is paying to promote it). Facebook scores these posts lower. What about Posts from Facebook Pages? As we have seen over the past few years, organic reach of posts from Facebook Pages has massively declined. Not every post will be shown to each user - Facebook's algorithm is only showing the most relevant ones instead. The guidelines above for scoring still apply to Page posts, with a few exceptions. Facebook recognizes that not all comments on a Page post are positive and therefore may not be a good indicator of a user wanting to see more of them. 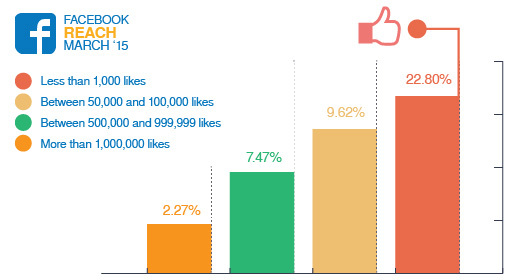 So, likes and shares on Page posts are given more weight than comments. When a user hides an individual post or all posts from a page, this can affect the likelihood of not only that user but other users seeing Page posts for some time. So, it is important to monitor how posts are being received. Facebook says that they focus mostly on "positive signals", but these negative signals still have an effect. Promoted posts work differently - the promoted side goes through the Facebook Ads auction system, where they compete with all other posts that are targeting each user. The organic sides continues to behave as before. Align your content with your fans - what do they want to come from your Facebook Page? What content will resonate over the long term? Provide context for your posts - give users what they expect when they click on your posts. Be timely - people want the latest news. Make sure to add your expertise and insight. Use all the data - use Page Insights to see what is and isn't working, what gets engagement and what gets hidden. Experiment - figure out what gets the most reach and engagement for your Facebook Fans. Post often - Facebook says that you can post more often than you think and let their algorithm figure out what to show each user. Experiment with your own limits. Be proud of what you post - the better your posts, the more likely users are to engage with them.